Imagine a place where your child can create a piece of art without the pressure of a grade, the stress of a deadline, the absence of a requirement, with and endless supply of tools for his or her creation. Imagine a place where he or she can speak openly about personal emotions and loss. This is a place where people listen free of judgment. It is somewhere that, after hearing how you drew the birds in the sky and they did not come out how you wanted, your neighbor throws her paintbrush in the air and shouts: Mistakes become discoveries! We’ve found our place. This is why we love the Garden of Fire. The Corning Youth Center went to The Rockwell Museum on Tuesday. A discussion and meditation led by CareFirst’s Chelsea Ambrose prompted a powerful conversation about grief and loss experienced in the lives of our youth. A safe space was created for youth of different ages, backgrounds, and experiences to connect through their hardships and no longer feel alone, but to feel united and empowered by those sitting beside them. We walked through The Rockwell and discussed pieces of art through their expression and meaning and how each child can express themselves when they sit down to create art. This week’s project was to create and design a clay tile. 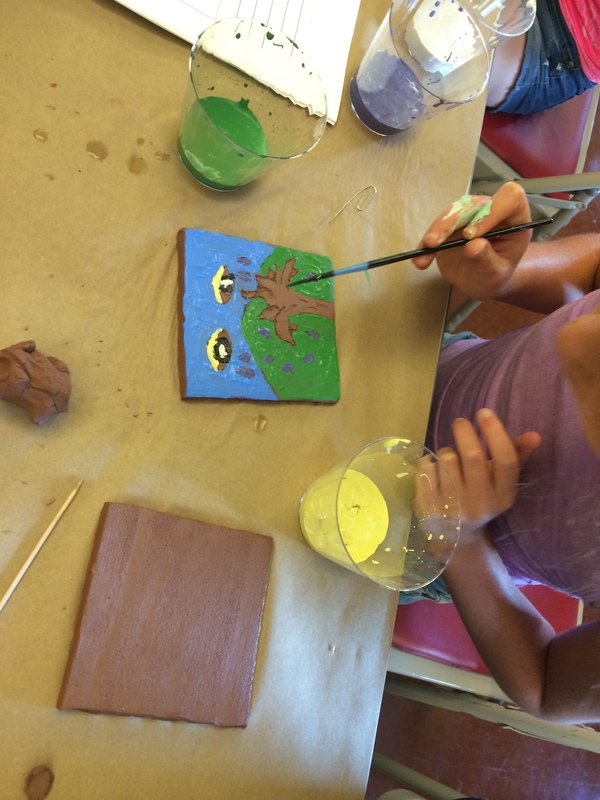 A ten year old described her clay tile. “The clouds are eyes and the raindrops are tears.” She told me the tree represents growth and how she will never stop growing. This was a beautiful project. The Garden of Fire has given our youth an outlet of expression where words do not suffice. This is why we love the Garden of Fire. 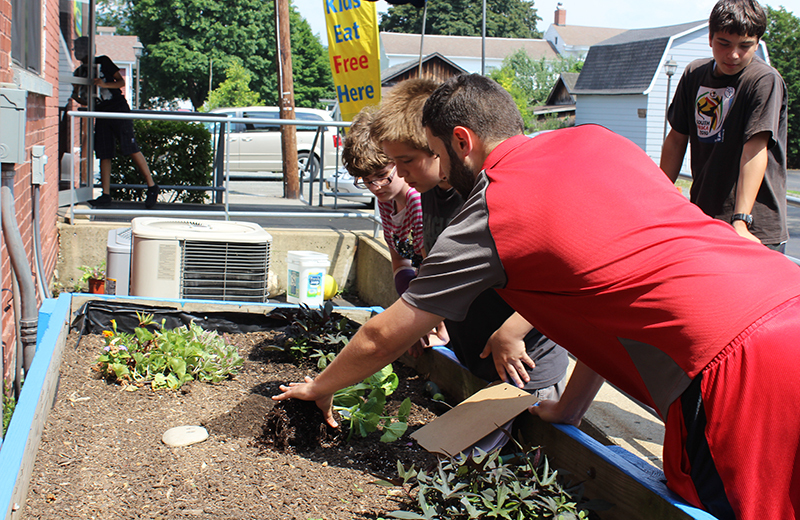 At the Hornell Area Concern for Youth, creating a garden has been a fun, educational, and nutritional piece of our summer program for the last six years. We like to experiment with a variety of vegetables in our raised beds, and it’s been a learning experience. We have always grown tomatoes; the year that the region experienced wide-spread tomato blight, we used it as an opportunity to teach our students why and how blights can occur. Last year, with the start of the Garden of Fire program, our gardening projects reached new heights. Ian, from Tanglewood Nature Center, came to us early on to get us started for growing season in a whole new way. He taught the students about our particular type of soil, and how geological changes like glaciers can affect the richness and nutrient content of soil in a given region. He taught us so many things we hadn’t considered in the past, including preserving our vegetables to eat all-year-round. We learned to can our vegetables last year, turning cucumbers into delicious pickles, and our beautiful tomatoes into spaghetti sauce. Those were treats that we have enjoyed all winter. Now it is time to start anew for this year. We have been so busy with our spring programming, that admittedly we got behind the growing schedule. Amazingly – count our lucky stars – Paul Shephard Jr., our Special Projects Coordinator, received a call from a group looking for volunteer opportunities. The camp counselors, all twelve of them from Camp Stella Maris came with gardening tools in hand to help us take control of the garden again. 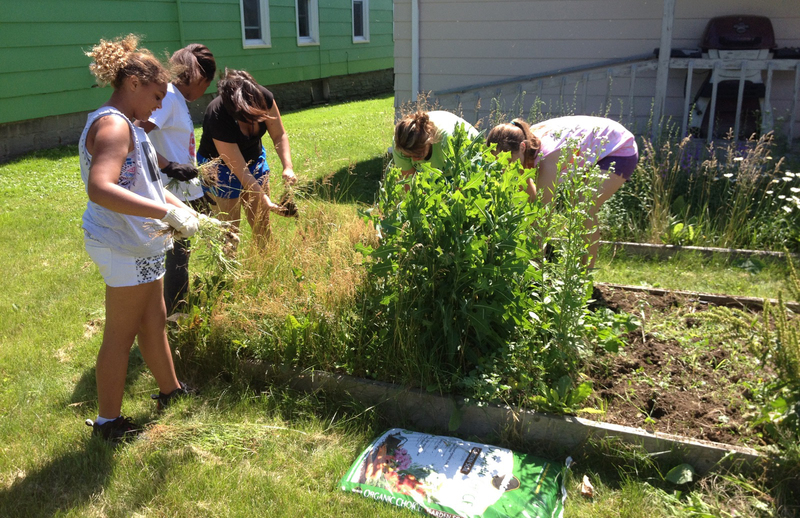 They took on the enormous task of weeding, adding organic fertilizers, and disposing of the grass. 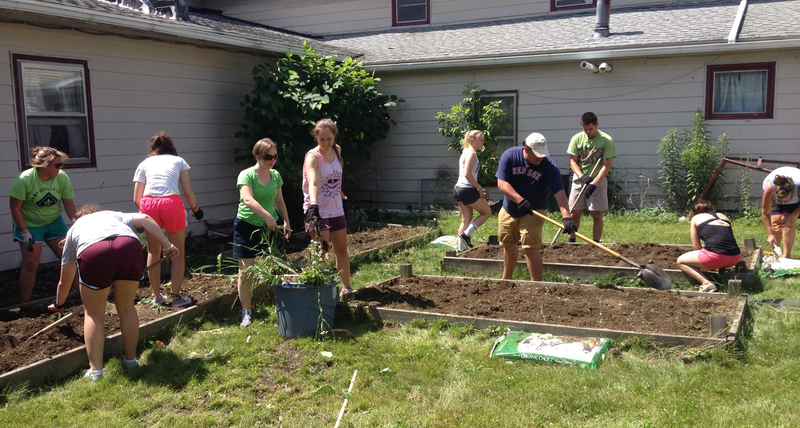 Then, with the aid of our youth center participants, the group planted a beautiful garden. We are now prepared for another eventful summer of learning about the garden and how it can be a rewarding hobby. It really feels like the first days of summer when we look at the garden and it is weeded and planted. Now to keep it that way! In a few weeks we will be building new garden beds for the Wimodaughsian Free Library in Canisteo. Happy planting to all of the other gardeners out there!